As the present US administration’s modelling of old-school fascism dips into self-parody—two days into Passover saw Sean Spicer claim that Hitler “never gassed his own people”—well-meaning folk keep finding new ways to discuss whether or not it’s all right to punch Nazis. So this month I want to write about Lara Elena Donnelly’s Amberlough. The last in-depth review I did of a single book for this column was of Fran Wilde’s Cloudbound, during which I marvelled at how well it anticipated our current problems with populist demagoguery, media manipulation, and fake news. It was very much about how a single, profoundly united society could fracture along its fault-lines into civil war while the environment it takes for granted begins to crumble. Amberlough makes an interesting point of comparison: The four federated states of Gedda begin as diverse, semi-autonomous entities, and the novel charts the fall of decadent, liberal, politically regional Amberlough to Tatié’s conservative and aggressively unifying One State Party (called Ospies). Focused on spies, smugglers, and cabaret performers, Amberlough’s particularly interested in the complicity and resistance of those who tell lies in the spotlight in order to operate honestly in society’s shadows. Cyril DePaul is a bored spy from a wealthy family, and wears the trauma of past fieldwork in a scar across his stomach. Aristide Makricosta is a smuggler and wildly popular emcee at the Bumble Bee Cabaret, and has worked hard to disguise his class and ethnic origins in the big city. Cordelia Lehane is a sharp, streetwise performer, and makes ends meet by being the Bumble Bee’s top dancer while dealing drugs on the side. In spite of being on opposite sides of the law, Cyril and Aristide are lovers, for whom part of the thrill is keeping each other on their toes. But things go wrong when Cyril’s higher-ups send him out of state and back into the field to gather evidence of the Ospies’ electoral fraud in order to discredit their leader: Cover blown, Cyril agrees to be a double agent, offering to hand them control of Amberlough’s police force in exchange for exit visas when the jackboots come to town. But part of the price is to appear morally unobjectionable to the Ospies until then—so Aristide recruits Cordelia to be Cyril’s beard. I haven’t seen any iteration of Cabaret—neither film nor stage production—so in spite of it probably being the most natural comparison, it’s not one I’ll be making. Instead I want to say how beautifully Amberlough nails everything to do with performance—the clash of personalities, the energy and power of being on stage, the magic that transforms the tawdry into the tremendous, and the audience’s desire to touch it and be transformed in turn. The Bumble Bee is the beating heart of Donnelly’s depiction of the city: Everything to do with late nights, late mornings, rickety commutes, and inadvisable assignations felt real enough to taste. Donnelly’s prose is as dextrous and elegant as the performers she describes. Descriptions of food, coffee, and cologne linger with me long after I’ve turned the pages; characters read, touch, breathe, and taste each other with the immediacy and intensity of the theatre. I loved, too, that Amberlough City’s geography felt lived in and rigorously sketched, in everything from the streetcars to the invented, regionally inflected slang. In terms of sensory experience and evocation of the demimonde, Amberlough is superb. Where I have difficulty with it is where I have difficulties with Nazis—and where I wonder, as with Cloudbound, about how much our post-November world affects and afflicts my reading. My problem with Amberlough—an unfortunately substantial one, given its centrality to the story—is almost entirely down to Cyril’s motivation and character. Cyril loves Amberlough and hates the Ospies; both these facts are established far more effectively than the cowardice to which he frequently refers but seldom exhibits. It’s cowardice, claims Cyril, that makes him choose to dismantle his city for the Ospies; it’s cowardice that makes him sell out the people he cares about to save his own skin, and the skin of the person he cares most about. But Cyril is wealthy, privileged, and with diplomatic family connections; surely if all he wanted was to save himself, he could have done so immediately on returning to Amberlough? The middle chunk of the book is concerned with showing Cyril getting slowly tangled in the puppet strings of his spycraft in order to undermine his intelligence agency and turn the ACPD over to the Ospies, at great risk to himself—why do all that if he’s a coward? Why not put those skills (again, more told than shown—both Aristide and Cordelia are orders of magnitude more competent players of the game than Cyril is) to work for Amberlough? Which leads to the main problem I have with the book: If the inevitability of the Ospie takeover is meant to motivate Cyril to enable the Ospie takeover, then it wasn’t inevitable at all. 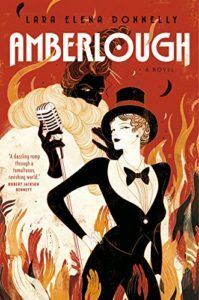 Reading Amberlough was an exercise in admiring the beautiful choreography of the main characters’ respective deceits without being able to suspend my disbelief about the plot. Cyril’s betrayal is meant to be tragic, something he loathes doing every step of the way—but he never stops doing it until there’s absolutely nothing he can accomplish by turning on the Ospies. He repeatedly sabotages his betrayal on his friends’ behalf, which begs the question of why he’s working to betray them in the first place, instead of helping them fight. It’s possible that I’m simply not in the right frame of mind to have sympathy for collaborators. It’s possible that I would have loved this book better if it were centered on Cordelia or Aristide, if it foregrounded their own ambitions and motivations instead of making them ancillary to Cyril’s. They’re all excellent characters, and they play gorgeously together, but the weakest link is the most load-bearing. One of the most effective scenes in the book has the performers of the Bumble Bee rallying together to tell the owner that the show must go on in spite of the loss of their lead satirist at the Ospies’ hands; everyone is terrified and grieving, but decide, together, to fight by whatever means they can. It’s a scene I love not only for the commitment to resistance, but because the threat there is so real, so visceral; what’s at stake is their livelihood and the wholeness of their bodies. I would have sympathised with any of them for choosing not to fight; I might have sympathised with Cyril if he’d faced anything like the same danger when he turned traitor. But the Bumble Bee performers face the danger they do as a consequence of Cyril’s smoothing the entry of the Ospies into the city. Perhaps, however inadvertently, this is Amberlough’s statement: The Nazis can’t win without well-to-do, cowardly collaborators. They can’t win without manipulation and deceit from those who should know better than to work against their own interests. At time of writing, Donald Trump has fired missiles at Syria and dropped the largest non-nuclear bomb in the US arsenal on Afghanistan for the sake of keeping up appearances. Waiting until the Nazis take over before fighting the Nazis is as effective a tactic as helping the Nazis in the hope of fleeing the Nazis. It’s something we’d all do well to keep in mind.